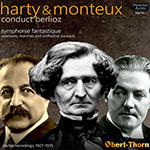 This release commemorates the 150th anniversary of the death of Hector Berlioz (1803 – 1869) by presenting recordings by two of his greatest conductorial advocates: Sir Hamilton Harty and Pierre Monteux. Harty’s complete commercially-recorded Berlioz repertoire is collected here in its entirety for the first time (a 1991 Pearl CD featured all but the King Lear Overture), coupled with Monteux’s complete pre-war recordings of the composer’s works. Irish composer/conductor Sir Hamilton Harty (1879 – 1941) considered Berlioz and Mozart as his two musical deities, due to what he perceived as their shared intuitive approach toward composition. His longest conductorial post was with the Hallé Orchestra of Manchester (1920 – 1933), whose founder, Charles Hallé, had been a friend of Berlioz. Hallé had begun a tradition of Berlioz performance with his ensemble which Harty continued and expanded into the then-new realm of recordings. Beginning with acoustic versions of the Hungarian March from The Damnation of Faust (1920) and the Roman Carnival Overture (1924) for English Columbia, Harty presided over a string of nearly annual electrical sessions featuring Berlioz works. After leaving the Hallé, Harty made several recordings as a guest conductor of Beecham’s newly-formed LPO before making a final series for Decca in his last post as music director of the LSO, although the latter were hampered by the use of a small hall, inferior engineering and noisier pressings. Throughout, Harty’s immense vitality and disciplined ensemble playing have rightly made his Berlioz discs legendary. The Harty transfers were made from the best portions of pre-war American Columbia and early laminated English Columbia pressings, while the Monteux recordings came entirely from US Victor “Z” pressings. Multiple copies of each record were located in order to ensure the best sources were used.